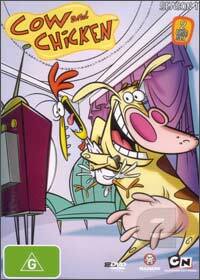 From the same vein as Ren & Stimpy comes Cow and Chicken that is about two loveable "friends" who live in suburbia. The punch line of Cow and Chicken is that it revolves around a universe of human friends and relatives and when Chicken decides to get up to mischief, the hero known as Supercow uses his bovine powers to keep the world of man safe. What the? Probably my favourite episode of the series is the "Ugliest Weenie" which is about an ugly weenie which had me in hysterics... and maybe episode two which focuses on Cow and when a fashion photographer spots her, she soon becomes a Supercow model. Actually, too many enjoyable episodes to name a favourite. Although "G" rated, Cow and Chicken Season One has quite a bit of adult innuendo which makes this series a DVD that can be watched by children of ALL ages. Great stuff! The Ugliest Weenie - part one. The Ugliest Weenie - part two. Or three.